Curriculum Guide for Our School Garden! and more! Will Allen comes to Seattle and more! It was a busy week! Will Allen visited Seattle and delivered an inspiring presentation of his the work of his organization, Growing Power, to several area schools, the Focus on Farming conference, and at the Seattle Public Library. Growing Power is a national nonprofit organization and land trust supporting people from diverse backgrounds, and the environments in which they live, by helping to provide equal access to healthy, high-quality, safe and affordable food for people in all communities. Growing Power implements this mission by providing hands-on training, on-the-ground demonstration, outreach and technical assistance through the development of Community Food Systems that help people grow, process, market and distribute food in a sustainable manner. Seeing the work they are doing in urban areas throughout the U.S. and abroad (Kenya is one of the other countries highlighted in the presentation) made me feel like we really can feed the world using local food. Will Allen is a MacArthur “genius” award winner and deserves it! Two days after seeing his presentation I ended up observing a Flagship Foundation Pure Food Kids workshop (http://www.purefoodkids.org) at Olivia Park Elementary School in Mukilteo, WA. Will Allen had visited Olivia Park just two days before because their school garden program is run by Farmer Frog (farmerfrog.org) which is affiliated with Growing Power. 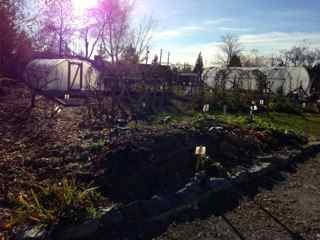 The photo of the garden shows that is mostly “asleep” for the winter right now, but that it is a large and well-organized teaching garden. The Pure Foods Kids workshop teaches fourth and fifth grade students how to read food labels to encourage them to stay away from heavily processed foods filled with preservatives, food coloring and sugar. It not only is a attention-keeping hands-on workshop, the students get to cook! At the end of the 2.5 hour long workshop we all ate some delicious vegetarian chili prepared by the entire class. It was delicious. The best thing? The workshop is free! If you’re in the Seattle area consider it for your school.